Short version: a huge reduction in many of the programs they rely on. The latest iteration of Paul Ryan’s budget is out today, and while you might expect it to look very different than the one proposed before he was part of a losing presidential ticket, he seems to have dug in his heels on some of his most extreme proposals, like block granting vital programs, voucherizing Medicare and drastically slashing spending. As with the first rounds of Ryan budgeting, this one would be bad for nearly everyone (except perhaps the wealthy), but it would especially take an enormous toll on the country’s women. Women depend heavily on Medicaid. They make up 70 percent of its beneficiaries, which means 19 million low-income women have access to health care. Last time around, Paul Ryan wanted to block grant Medicaid. This time is no different. In its current form, Medicaid is a program in which states and the federal government jointly finance health care for low-income people. Because the federal government shares the cost with states, it also requires them to adhere to some guidelines on benefits and eligibility. In a block grant system, however, the federal government sends a lump of cash off to the states with no strings attached. Even if actual spending on the program isn’t reduced (which, given the huge cuts to government spending included in this program, those who are wonkier than I may find it will be), simply changing the structure of the program this way is a very bad plan. We’ve tried this experiment before: we block granted welfare, now called TANF, and it’s done a terrible job of helping low-income Americans, particularly as demand skyrocketed during the recession. In 2010, only twenty-seven of every hundred families living in poverty received TANF benefits. Some states could decide to increase benefits and eligibility, but given the tight budget constraints they face it’s much more likely that people will be dropped. In fact, somewhere between 14 million and 27 million could lose Medicaid coverage by 2021 under a block grant system. That will have a huge impact on the women who rely on it. But the picture gets even worse when you consider what else he wants to do. Ryan also promises to repeal the Affordable Care Act. While he doesn’t want to repeal cuts to Medicare spending included in the act, he does promise to repeal the benefits, perhaps the biggest of which is the Medicaid expansion. Women would reap huge benefits from the expansion of Medicaid, given that 13.5 million were expected to get health coverage that way by 2016. Other provisions that women have been benefitting from in the ACA: the end to gender rating, which was costing women an extra $1 billion a year; access to preventive care without a co-pay, netting a woman around $11,000 now that she doesn’t have to pay a co-pay for contraception, among other things; getting rid of “pre-existing conditions” like pregnancy and domestic violence; and many other great benefits. All out the window if Ryan gets his way. As with Medicaid, the majority of Medicare beneficiaries are women. Women live longer than men, but they also are far more likely to live in poverty in their old age, with twice as many women over age 65 in poverty compared to men. Ryan still wants to voucherize Medicare, even though the electoral trouncing he and Romney took last year seemed at least in part a rejection of messing with this program. Currently, taxpayers are on the hook for any increase in healthcare costs or premiums that are higher than expected. But with the voucher program, seniors get a coupon of sorts to buy insurance coverage—in its current form, Ryan’s budget allows for them to buy private insurance or Medicare insurance—and will have to make up the difference if the coupon doesn’t go far enough. Meanwhile, Medicare currently guarantees what services will be covered, but in Ryan’s program seniors will be responsible for determining what services they need depending on which insurers they pick. That’s a pretty difficult job in such an opaque market. On top of this, last time around the coupons increased so slowly that spending on the average 67-year-old would have dropped by 35 to 42 percent by 2050. Elderly women would see less and less support for buying the insurance they need. Women rely on food stamps to feed themselves and their families. They are more than 60 percent of adult SNAP (the food stamp program) recipients and over 65 percent of elderly recipients. More than half of the households that rely on SNAP benefits are headed by a single adult, nearly all women. Ryan’s plan would block grant SNAP the same as Medicaid. Currently, eligibility for the program has few restrictions, allowing it to serve a wide swath of needy people—47 million participants. On top of this, it’s extremely flexible, allowing it to be one of the most effective cushions for the rising misery during the recession. That would all change under a block grant. Eligibility would vary by state. Meanwhile, while SNAP reaches 75 percent of those who are eligible, we can look at the low rates of TANF participation to see what would happen if it were block granted. Ryan’s tax reforms would lead to the federal government losing out on $7 trillion in revenue, mostly with tax breaks aimed at the rich and corporations. But at the same time, he promises to balance the budget in ten years. To get there, he’ll cut spending by $5.7 trillion compared to the current baseline (which, lets remember, is already so low that it’s cutting into vital programs). These cuts won’t fall evenly on defense and non-defense spending—he actually increases defense spending compared to current law by $500 billion over the same time period. Yet discretionary spending will be cut by more than $200 billion. 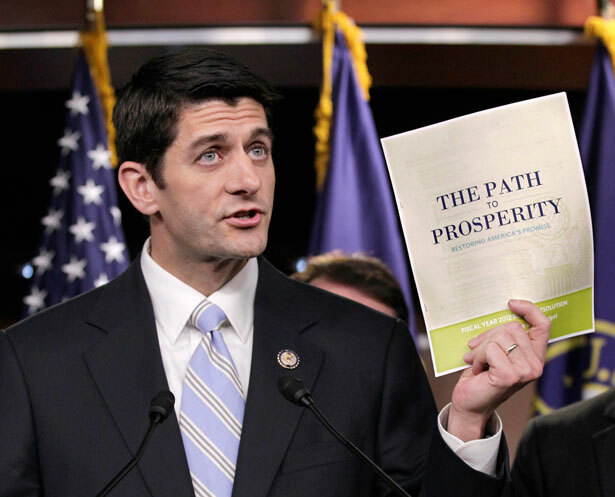 Ryan would extend the Budget Control Act caps, which is already set to cut $1.5 trillion in discretionary spending. Women benefit enormously from the programs funded by this spending. Over 80 percent of the households that receive Housing Choice Voucher rental assistance are headed by women. The Women, Infants and Children program, or WIC, helps 9 million low-income mothers and children with supplemental nutrition and health care referrals. Programs like childcare assistance and Head Start are also funded through this money. All would stand to see huge cuts. There are likely lots of other ways this budget will harm women—we’ll find out as budget wonks continue to analyze it. But it’s clear either way that Paul Ryan took his defeat and decided to double down on the policies he set forth. Women voters roundly rejected him and his running mate in 2012. This budget does nothing to address their needs and works against the most vulnerable among them. Who actually does support Paul Ryan’s budget? John Nichols answers.